What Those Words Mean - Clearing Up Some Backup Confusion - Ask Leo! You want to back up. You know you should. But every time you look into it you’re bombarded with confusing terms and concepts that feel completely foreign. They might as well be speaking some other language. In a way, they are. They’re “geek”. You’re not alone. You’re so not alone. The words get in the way! A couple of years ago I polled readers about their backup habits, and more importantly, their backup obstacles. Number one on the list? Terminology. The words that techies, and software vendors, and book authors used to describe backups and backing up and what you’re supposed to do were just so much gobbledegook to many people. 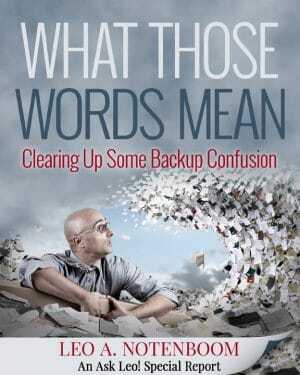 From that result my special report, What Those Words Mean – Clearing Up Some Backup Confusion, was born. An overview of the most important, the most common, and the most confusing terms you’ll encounter when setting out to save your precious data from loss and destruction. Have a look for yourself. Download the table of contents and the first chapter for free. Just right click that link or the image to the right and “Save As…” to download the sample PDF file to your computer. I believe in what I do, and I honestly believe that What Those Words Mean can help you. 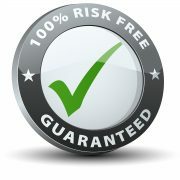 If, after purchasing you’re not completely satisfied, just ask me for your money back. No questions. No hassle.